Top things to do and see in Verona in one day. 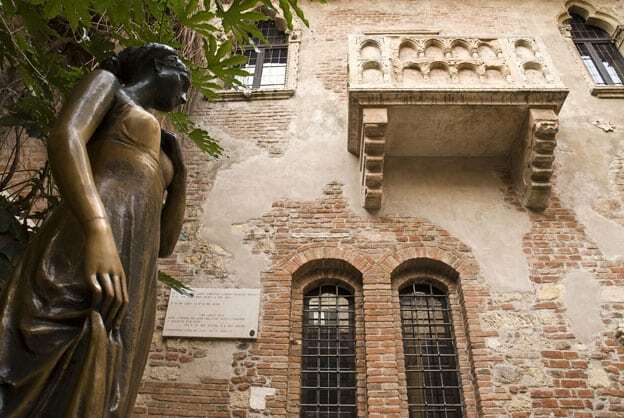 A walking tour to discover in a day trip the top sights and attractions of Romeo and Juliet lovely town. Few cities in Italy and in the world can be as romantic as Verona, arguably a perfect destination for lovers of all ages. You can easily visit Verona in one day and enjoy everything you may desire from an Italian top destination. Glorious past, beautiful setting, amazing monuments, delicious food, the story (legend?) of Romeo and Juliet… you name it, you’ll get it! 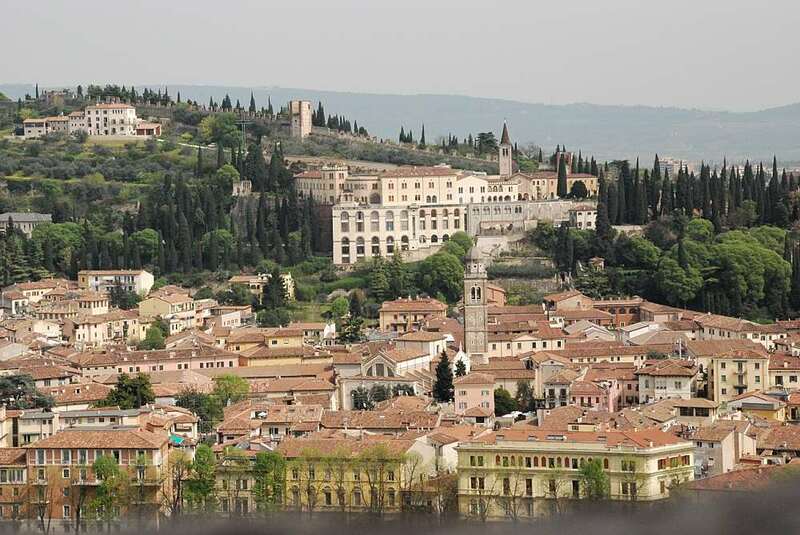 Oh, Verona is also listed among Italians UNESCO World Heritage Sites. Travelers just need slightly more that one hour to reach Verona from Venice by speed train (one hour twenty minutes from Milan). This makes Verona a perfect destination for a day trip from one of these cities. Of course, if you have enough time you can spend in Verona two or three days and even more, exploring Garda lake main treasures and (why not?) attending one of the many summer concerts held in the Roman arena. Said so, few travelers dedicate more that one day to Verona (too many things to see in Italy!). Therefore, in this post I’ll share a short walking itinerary aimed at discovering Verona in a day or so. The city center is fairly small, and most of it is pedestrian, so it’s really easy and enjoyable to discover it by feet. Unfortunately, unless you arrive very early in the morning, you may not have the time to explore also the other notable destinations such as the Roman theater, Castelvecchio (the old castle), san Zeno church and the Giardino dei Giusti (from which you can have a really nice view on the old center). But never mind, once you have discovered Verona for the first time, you won’t help coming back to spend there the time it deserves! 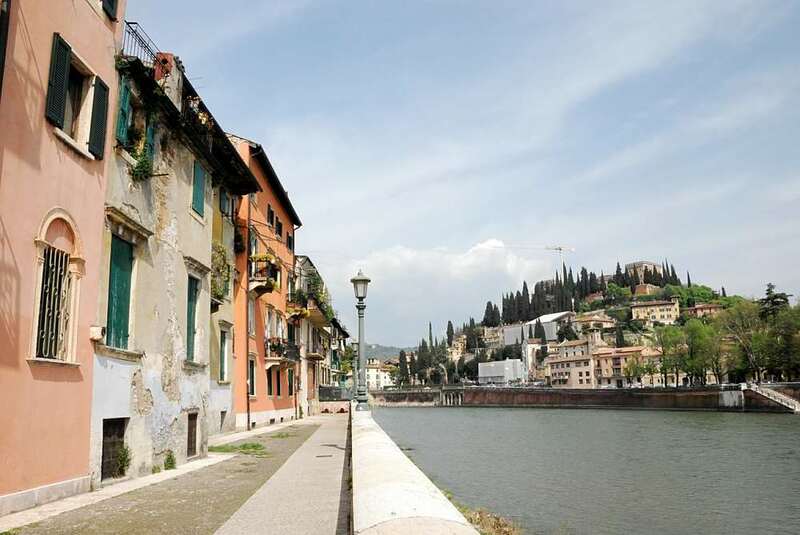 Verona can also be visited as an easy day trip from Milan. Click here to learn more! You walking tour starts from Porta Nuova. In front of you, the massive Roman arena stands out in the lively square. 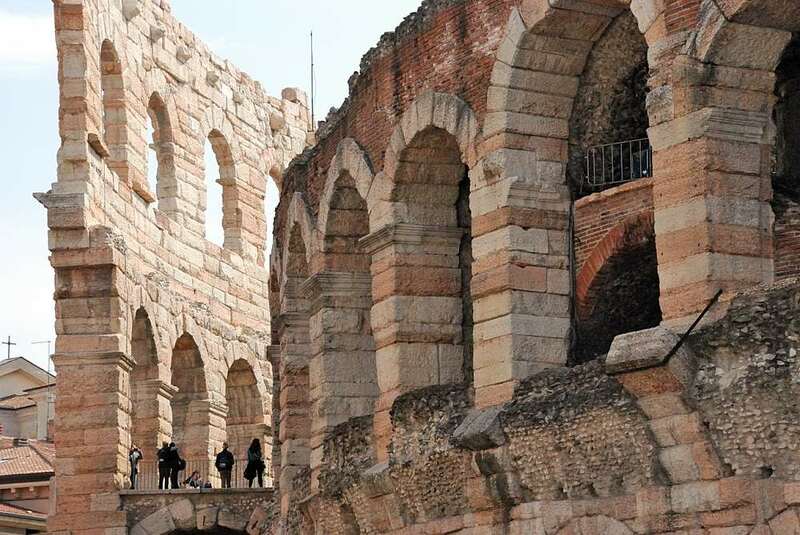 Still remarkably well preserved, today it’s home to Verona’s summer opera and jazz festivals. From Piazza Bra, the lively via Mazzini will lead you to the city center. 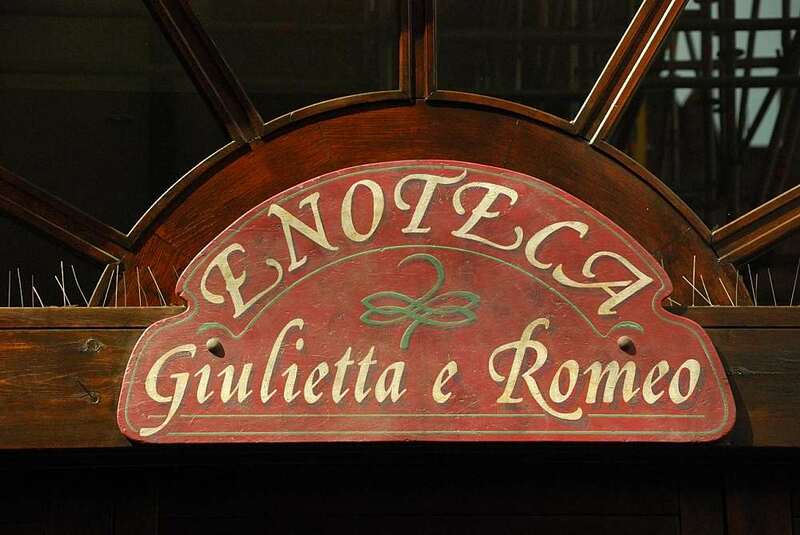 In a small street on your right (via Scudo di Francia), pay attention to the historical Bottega del Vino. It’s a perfect place to sip a glass of wine or to reserve your lunch. Nevertheless, I find really funny to look at the many ways tourists express their love, from writing it on the walls (note that walls are covered with drawing paper, changed from time to time and sold as souvenir! ), on the tiles (yes, you can purchase a tile and have it engraved, for just 75€! ), on the padlocks, and even on chewed chewing gums (do their beloved really deserve it???)!!! A hundred meters away from crowded Juliet courtyard lays beautiful and lively piazza delle Erbe. Once the Roman Forum, it is still home to a market. In the evening, it fills with locals and tourists sipping their Aperitivo at the outdoor cafes. It’s an excellent place for a rest, before climbing up Torre dei Lamberti. The Torre dei Lamberti (Lamberti Family tower) is a medieval bell tower just off Piazza delle Erbe. It was started in the 12th century and was raised a few times after that until it reached its final height of 84 meters. It also has 238 steps to climb… but you can cheat and take the elevator. The entrance is just near Palazzo della Ragione, look for the small passage way in Piazza delle Erbe. On top of it you will have fantastic views of the city and of the surrounding hills. Just after Piazza delle Erbe you will find the second most famous ancient square: Piazza dei Signori (square of the lords), a small square surrounded by monumental buildings. 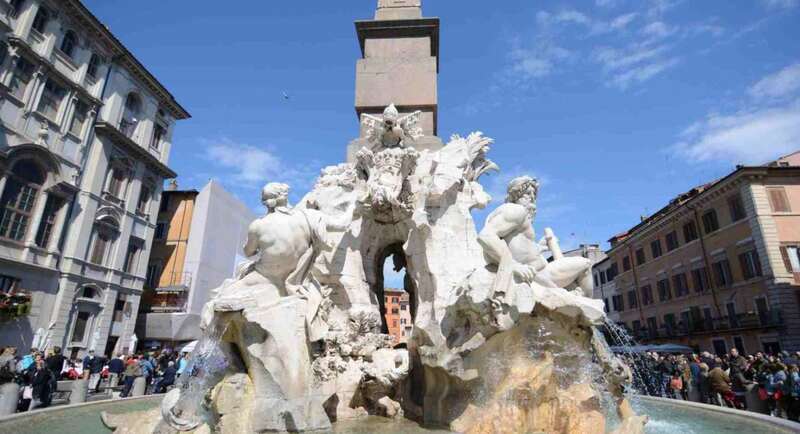 In the center is a statue of Dante and perched atop buildings around the square are more famous signori. This square was once the seat of the city’s public institutions. Just around the corner from Piazza dei Signori you will discover one of the most famous monuments of Verona: the Arche Scaligere. The Arche Scaligere are five elaborated Gothic funerary monuments, considered some of the best examples of Gothic art. They belong to members of the Scaligeri family, who ruled Verona in the 13th and 14th centuries. Take ten minutes to visit the nearby Santa Maria Antica tiny church. After visiting the Arche Scaligere turn right and head to the Lungo Adige. You will pass in front of what is “reportedly” the house of Romeo, a nice restaurant (Osteria del Duca) and many old palaces and streets. Here you will hardly see any tourist, and you can enjoy the off the beaten path side of Verona. Walk down the Lungo Adige (the banks of the River Adige) and enjoy the beautiful hills around Verona. In this area, you will find many nice restaurants, especially in delightful old via Sottoriva street. 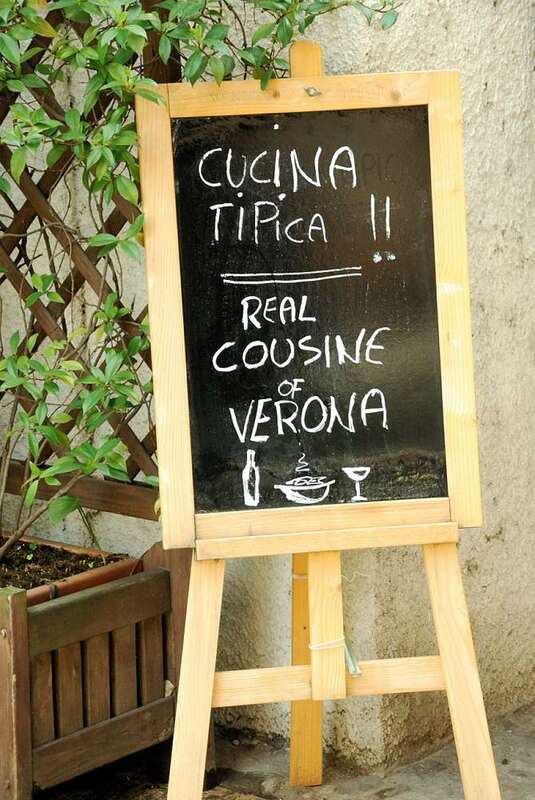 It’s an excellent place to taste the typical Verona cuisine. Choose your preferred restaurant under the old porticoes. Traditional dishes in Verona include the Baccalà (salted cod served with polenta, ie mais pudding) and pasta e fagioli (pasta with beans). After your lunch, you can visit some really astonishing churches: Sant’Anastasia and the Duomo. Sant’Anastasia is my preferred church in Verona, and you will find it very close to via Sottoriva. Despite its unfinished façade, its interior has some amazing artwork, including renaissance frescoes, paintings and sculptures. Begun in 1290, but not completed until 1481, it’s Gothic/Romaensque in style and Verona’s biggest church. Its an amazingly beautiful church, well worth the entry ticket (included in the Verona pass). Before heading to the Duomo (Verona cathedral), take some time to admire the old Roman bridge, the “Ponte di Pietra”. Verona’s main cathedral, or Duomo, is a stunning 12th-century church. It is actually a complex of buildings that includes a 12th century Baptistery, the Canons Cloister, and Saint Elena Church and remains of a 4th century paleo-Christian basilica. The octagonal Romanesque baptismal font is decorated with carved Biblical scenes. It was carved out of a single block of marble. The Baptistery has frescoes from the 13th to 15th centuries. The cathedral’s frescoes are from the 15th to 18th centuries and the exterior is decorated with 12th century reliefs. We are approaching the end of this tour, but we still have to admire one of Verona main highlights: the Porta Borsari. Located at the end of – guess what – corso di Porta Borsari, this ancient Roman gate once marked the southern entrance into Verona. It’s a great and beautiful example of Roman taste for theatrical scenes, even in civil buildings. From Porta Borsari, get back to piazza Bra to get the bus to the station. Subscribe to Delightfully Italy monthly newsletter! Verona can provide you with all kind of great experiences! Click here to check your many options, from guided tours to shopping, food experiences and more! Like Delightfully Italy? Then why don’t you support it! Are you planning to visit Italy for the first time? Have you already discovered Venice, Rome, Florence, the Amalfi coast, and still want more? Either way, delightfullyitaly.com is here to disclose to you Italian Must See as well as Italian hidden treasures. I love Verona (except for the horrible Juliet bit). You have shown me a few things I haven’t seen, thank you. I will look for them on my next visit. thank you very much for this itinerary.. covers most of the places one would like to see. checkpoints on map is a nice addition which is very helpful too. Thks Meg. Indeed, Verona is a lovely city! A fantastic town! Very romantic and traditional. And the article very helpful even if in less than 5 hourse we went to the castle and we almost walked the center, as long as for the Baccalo, I didn’t liked it at all, haha personal taste, I would suggest pasta with rabbit! Much nicer!!! Great post and fantastic job with the map ! Me and my wife went on a day trip from Venice and we were very happy with this walking tour. We added Piazzale Castel San Pietro since we still had some time left. Thank you ! Hi Antonio, thanks for your comment, I’m so happy you found my post useful! Hi Jean, would love to go for a day trip in Verona during December’16, is it crowded during December? if we arrive at Verona main station, place of attraction near train station? Hi Irene, Verona shouldn’t be crowded in December, but trains to get there may be around the 8th and the 11th, when masses of people travel to visit Xmas markets in South Tyrol (you can consider to go as well, hot spots are Merano, Bolzano, Trento, the Xmas market go on until end of December, they are quite nice). Verona station is 20-25′ walking from the city center, you have buses to get there, bus stop is in front of the station. Buses will stop at the Roman arena: there you are in the city center, and you can walk to Piazza delle Erbe, the true city center (10′) and can wander around,enjoying this delightfull city. Thank you very much! how many hours does this tour requires? is it possible to do it in 5 hours? Yes, even though you won’t have much time to relax in a nice café or to have a nice lunch..
Great job! My wife and I visited Verona and did your itinerary suggestion. Thanks a lot! Thank you for such a helpful itinerary and map. I look forward to my first visit to Verona this December. Thank you for such an inviting and interesting itinerary. My husband and I are visiting the area in May this year and will make good use of your suggestions to ensure we get to see as much of Verona as we can.